At R & S Law Group, LLP, we advocate co-parenting as an effective option for families in transition. After all, the benefits of a continued, meaningful relationship with both parents are tremendous, and parents should always prioritize the well-being of their children above all else. However, obstacles such as distance can seriously complicate and undermine your co-parenting efforts. These days, it isn’t uncommon for parents to live farther and farther apart, especially when a job or other obligations take a parent to another city/state. Fortunately, there’s a few promising options and strategies that can benefit parents and children who live large distances away from each other. This post goes over some tips that can help you maintain a strong relationship with your children and mitigate the effects of distance in your co-parenting efforts. Technology has allowed us to make huge strides when it comes to communications, and people can now use a variety of apps and other solutions to stay in touch with their loved ones, anywhere and anytime. Parents can easily get in touch with their children and integrate video calls, texts, phone calls, and the sharing of media into their long-distance interactions. This helps the family feel more connected and helps promote a sense of closeness and trust. Stability is important for the well-being of a child, and maintaining a regular schedule is crucial for parents who can’t easily see their children in person. Not only that, but one of the biggest challenges that co-parenting brings is the need to coordinate and plan with the ex. This isn’t always an easy task, but a clearly-defined schedule that everyone adheres to can help simplify matters and minimize the potential for fights/arguments with the other parent. 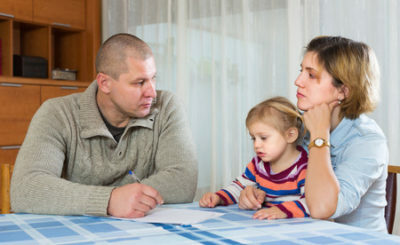 The flipside to the last tip is that, while regular schedules are an important component of an effective co-parenting plan, both parties should also be willing to remain flexible and adapt on the spot. Life is unpredictable, and the strain caused by distance can be aggravated when said schedule gets in the way of other obligations. As always, do your best to consider your child’s needs above your own. Co-parenting is no easy task, but hopefully this set of tips can help you establish a more effective, mutually-beneficial arrangement. If you’d like to learn more, or to speak with a qualified attorney about any matter relating to divorce, child custody, or family law in CA, don’t hesitate to reach out to us at R & S Law Group, LLP. Call us today, we offer free initial consultations.